Two great tastes that taste great together, gluten-free roasted carrots and hummus are the perfect wholesome snack. While prime carrot harvest seasons are late spring and fall, you can make this dish with great results year-round. You can prepare the hummus ahead of time, cover the surface with plastic wrap, and refrigerate until ready to serve. Preheat the oven to 425°F. Toss the carrots with the 3 tablespoons olive oil, 1 teaspoon salt, 1/2 teaspoon pepper, and the sumac and honey. Transfer to a baking sheet and bake until tender and caramelized, 20 to 30 minutes, depending on size. In a food processor, combine the garbanzo beans, garlic, and lemon juice. Puree until smooth, stopping to scrape down the sides of the food processor as needed. Add the tahini, warm water, and 1 teaspoon salt and process until light and creamy, about 3 minutes. Drizzle in the remaining 1/4 cup olive oil while processing and puree until smooth. 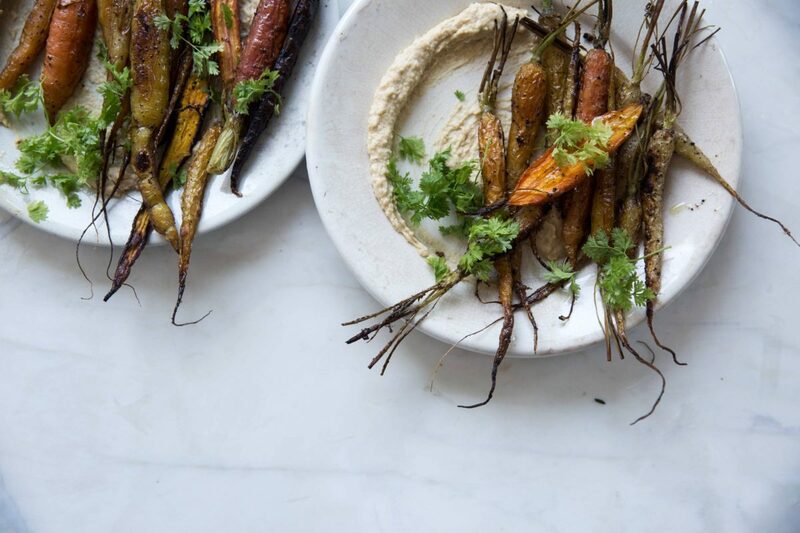 Spread a large scoop of the hummus on each of 4 plates or on 1 large serving platter, top with the roasted carrots and chervil, and serve.